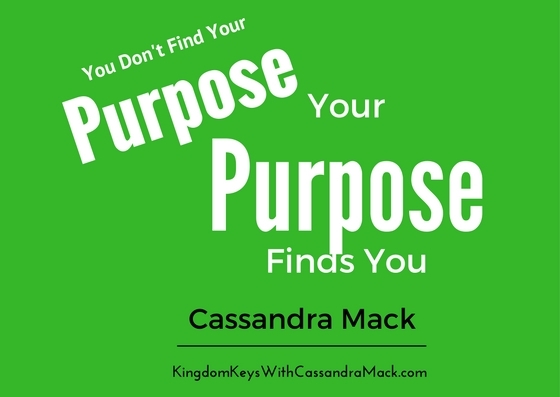 Have you ever felt like you needed to find your purpose or that your life was stuck in a rut? If we are honest, most of us have felt this way at some point in life...myself included. And I think that the reason why a lot of us struggle with the notion of feeling purposeful is because we tend to see purpose as this big Ah Ha moment, when in all actuality our purpose is already inside of us and it's simply a matter of releasing what's on the inside a little more each day. Every time you make someone smile or you make someone's life better in any way...even on the smallest level...you are releasing your purpose. If you buy a homeless person on the street, breakfast today, you are living with purpose. No "Ah Ha" moment or bells ringing loudly from the sky. Nope!...., just you being good to people and using what you have, be it: a particular skill, talent, resource or a random act of kindness to be fruitful and multiply for as long as you're on this earth. .
For example: If you are meant to sing,you will find yourself always singing, even if you don’t have a record deal. Not having a record deal does not mean that you are not meant to sing, if your purpose is to bring rhythm, melody and tempo wherever you go, then that's what you will do. If you are meant to feed people, you will find yourself always baking and cooking, even if the place you bake and cook is at family gatherings and office functions. Not having a catering business or a restaurant does not mean that you are not meant to feed people, if your purpose is to pour comfort, nourishment and sustenance into the lives of others. Many of us question or doubt our purpose, not because we don’t have the talent and capability to carry our purpose out, but because we have a very limited notion of what purpose is and the diverse ways that our purpose can be carried out. Your job title is not your purpose. It’s your source of employment. Your job title might be that of a janitor but your purpose on that job is not just to supply janitorial services; but to provide custodial care of the facility by way of doing your best to make sure that everything in the building from the basement to the roof is maintained and in good working order so that the people who come into the building can live or work in a clean, well maintained space. When we look at the subject of purpose, we must learn to stop focusing on what we don’t have so we can serve from the space of what we do have. Today, I want to challenge you to change the Trajectory of your Thinking. Instead of looking at purpose through the lens of lack and limitations, let’s go back to the very beginning of creation in the book of Genesis so that we can have a NEW PARADIGM for PURPOSE. Let’s look at Adam’s assignment from God (purpose) concerning the naming of the animals. Can you imagine if Adam would have allowed self-doubt and the fear of missing the mark to stop the flow of his purpose? Adam didn’t have a conference call with the Whales or the Tigers to ask what he should name them. He simply stepped out on faith and gave it his best shot. Now you might not look at naming the animals at the Genesis of Creation as that big of a task, but I beg to differ. Because if you were called in Adam’s place: How would you know to name a giraffe a giraffe and not a gold fish or a hamburger? Could you imagine referring to a giraffe as a hamburger? And if you fast-forward to today and wanted to order yourself a hamburger, how would the restaurant know that you didn’t want a giraffe on a bun? I’ll tell you. Because Adam successfully accomplished this particular purpose. I know it sounds very silly because I am oversimplifying the point in order to illustrate the importance of knowing your purpose and entrusting God to equip you for your assigned tasks. Not only did Adam trust God, Adam also knew that if he got off track with respect to his animal naming assignment that God knew just where to find him and how to redirect him back on task. Adam also knew what his purpose was for that particular season in his life (his season of PRODUCTIVE SINGLENESS) and he trusted God to equip him for this task. And when it was time for Adam to multiply, Adam didn’t stress or complain about the fact that he was single or get ahead of himself and take matters into his own hands by trying to mate with a Hyena, he simply went on about his purpose …And then he rested in God’s providence. And when he woke up, he saw that God brought him his Eve. This is how purpose works. Purpose will find you, even when you're resting. Purpose shows up no matter what so that we can be productive, no matter the season in our lives. Purpose empowers us to rest in God’s providence and operate in divine timing. If your purpose is to be a healer, you will find a way to be a healer…whether you do so by going to medical school and becoming a board certified doctor or weather you pursue a non-traditional route to lead others towards healing their hearts and minds. If your purpose is to be a teacher, you will find a way to be a teacher …whether you do so by going back to school to get a degree in Education or whether you teach through writing a blog and speaking. If your purpose is to feed people, you will find a way to feed people …whether you do so by starting your own catering business, becoming a chef at a restaurant or serving food in a homeless shelter, your place of worship or a school cafeteria. If your purpose is to help people you will find a way to help people …whether you do so by becoming a lawyer, counselor, coach, crisis hot-line operator, an usher at your church or a member of the PTA at your kids school. Your purpose is not limited by your current skill set, level of education or training, because God can direct you to the right people and the right resources to make it happen. So whether you have a GED or a PhD, if you have a seed of greatness on the inside, then you have a purpose that needs to be lived out. Proverbs 16:3 gives us a strategy as it relates to our purpose and it’s simply this. “Commit your works to the LORD, And your thoughts will be established.” This means that if we entrust and place our plans and purpose in God’s hands, He will set us up with the people, experiences and resources that we need to make it happen. Today know that you don’t have to have all the pieces together to start walking into your purpose. And if you are spinning your wheels like a hamster trying to figure out your purpose, perhaps it’s time to spend some quite time with God and simply ask: What do you want me to do?